SaulPaul is an indie artist making major moves since releasing his now classic album Tower to Tower through his own ReRoute Records imprint in 2007. This was followed up with 2011’s Mind Right MixTape along with the launch of the newly dubbed and expanded ReRoute Music Group. 2015 was a big year for SaulPaul. He released Dream in 3D, an album he worked on with platinum selling and Grammy nominated producer Billy Smiley. The project went on to be considered for a Grammy itself. SaulPaul also released a mixtape in partnership with the Core DJ’s own DJ SKNO. SP and DJ SKNO debuted the mixtape “It Was All A Dream” at the 25th Core DJ Conference in New York City. SaulPaul has toured all over the US and Canada as a solo headliner. In addition to his his own concert tour, he’s played the the festival circuit including shows at Summerfest and Musikfest. 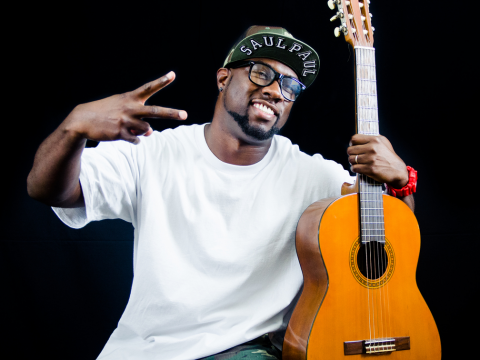 SaulPaul, a skilled songwriter has also penned songs for companies like the NFL, the NBA and ESPN Radio. And not only is SaulPaul a songwriter, but he is a music producer as well. His music production has been featured in commercials and campaigns of some the world’s most prominent brands such as Honey Bunches of Oats and Johnson & Johnson. His limitless talent and creativity have led to him performing at two TEDx talks and Google. The perpetual question asked of SaulPaul is always…What’s Next? The current answer: The release of his latest album – Tower to Tower 2 in 2016.